In recent days Pearson, the world’s largest education company, has been in the news due to plans to sell the Financial Times and talks to sell its 50% stake in the Economist Group. It’s been estimated that these divestments will yield $ 1.5 bn net proceeds. Pearson will focus fully on education in the future. Pearson expects growing and sustained demand for education, particularly driven by an emerging middle class in international markets and the digital transformation. The opportunity is to enable greater access, better affordability and improved achievement. They are working on transforming their business by building positions in fast-growing economies, shifting to digital and services, and promising to deliver measurably improved learning outcomes. With annual global spending on education estimated to be about $ 4.5 tn, Pearson sees space to grow current revenues of about $ 7.75 bn. What could this mean for Pearson? “You’re a global education company or you’re a global journalism company — both great things to be, but it’s hard to ride both horses equally well,” John Fallon, CEO of Pearson, said after the sale of the FT was announced. “We’ve reached an inflection point in media, driven by the explosive growth of mobile and social. In this new environment, the best way to ensure the FT’s journalistic and commercial success is for it to be part of a global, digital news company.” The leadership and management of Pearson can now focus fully on the growth and transformation strategy of their education businesses: emerging markets (growth), digital and services (growth and transformation) and outcomes (transformation). Pearson already has some attractive positions in emerging markets and has taken a leadership role in the industry on outcomes, but is arguably not (yet) a frontrunner on the digital transformation. All three of these pillars will require leadership and heavy investment in the coming years and will therefore likely benefit from an increasingly focused strategy. With a rich pool of talent and an excellent reputation the company should be better placed to focus on the transformation of the education business. 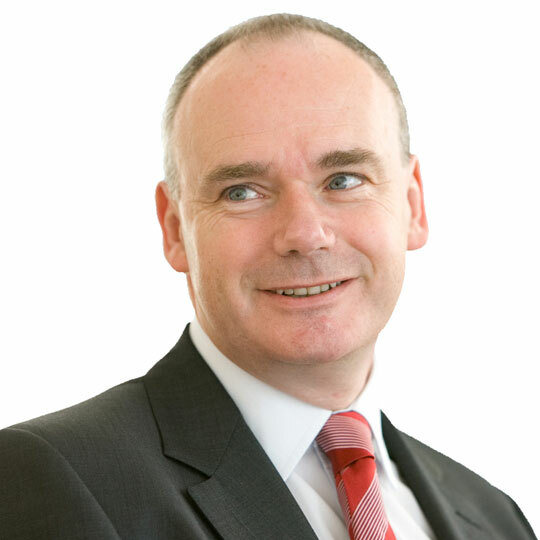 Given a stronger balance sheet, Pearson should be more favourably positioned to make further investments in organic growth and to acquire other companies in digital and services, and international markets. This should in principle lead to better growth prospects for the company and a higher valuation. What could this mean for education markets? My view is that a successful Pearson should be good news for customers. Looking at the big picture, if Pearson is successful in enabling greater access, better affordability and improved achievement in education in countries across the globe, this must be a good thing for our people and planet. And their success will likely encourage new entrants and more innovation in the industry which should yield further benefits for customers too. I would imagine that this will be good news for employees with the skills and ambitions to support Pearson’s growth and transformation agenda and vice versa. If you’re a growing digital education or service business in an emerging market, are making a measurable impact on outcomes and looking for an exit, this is probably good news :-). However, if you are predominantly a print publisher in one of the markets where Pearson is currently strong, it’s likely you will have to raise the bar to stay competitive. It’s not easy to see a direct impact on a company like Sanoma Learning which is arguably further on the digital transformation and operates in different markets, although there could be increased competition for international opportunities in digital down the line. Will these divestments secure Pearson’s leadership position in the industry? At this time, the company’s position seems secure: they are global market leader, they have a good growth and transformation strategy brought into sharper focus, an improved balance sheet and competent leadership. However, with a large “legacy” business, complex operating model, new competition from agile startups and a less friendly regulatory environment, it’s not a home run. Keep an eye on McGraw-Hill Education – they’ve been making smart and agile steps in recent times too as they reposition themselves as a “learning science” company. It will be fascinating to experience the dynamics in this industry in the coming years as the giants transform themselves, new giants such as Google and Microsoft build their positions and (edtech) ventures such as Udemy, Edmodo, Altschool and NetDragon disrupt the market. I’m interested to hear your views on this. Looking forward >>. This entry was posted in Digital, Edtech, Education, Leadership, Learning, Pearson, Sanoma Learning and tagged Education, FT, Learning, Pearson, The Economist on 27/07/2015 by johnrichardmartin. Last week I visited the EdTechEurope conference in London. Congratulations to the team for putting together a rich program and high quality of production! I love meeting the entrepreneurs and sensing their passion. It’s great to hear their vision and see the innovation. They trigger my curiosity. How could we put this to work for better learning impact for our customers? What could this mean for the educational ecosystem we serve? Could this company disrupt our business? 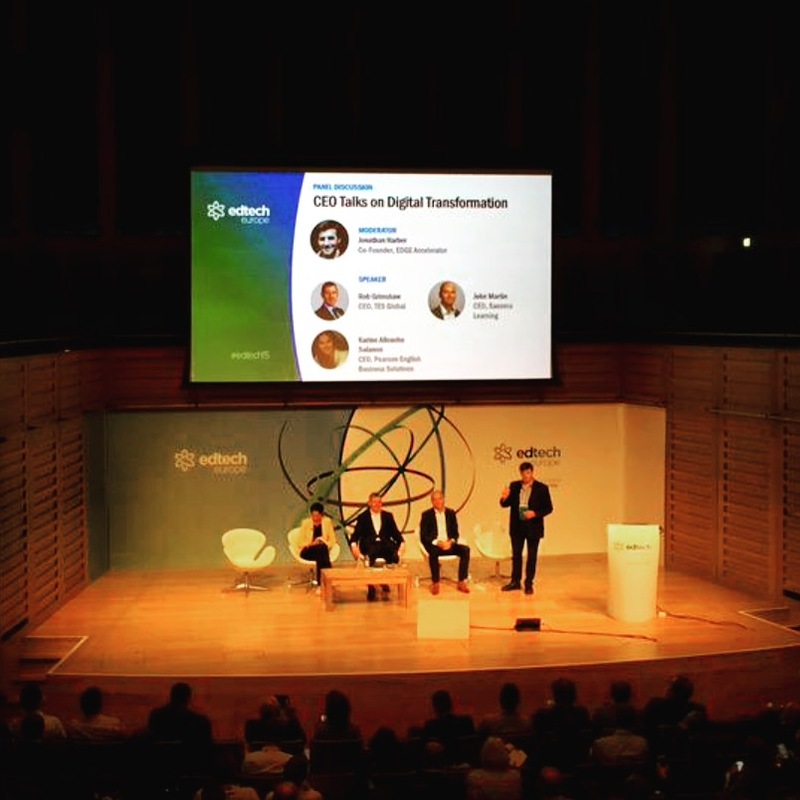 I’m a member of the Advisory Board of EdTechEurope and spoke on the panel “CEO Talks on Digital Transformation” together with Rob Grimshaw (CEO at TES Global) and Karine Allouche Salanon (CEO at Pearson English Business Solutions). There was a lot of talk about the role of the teacher in this session which I liked since I believe the teacher is the killer app in education. I wonder if this conference tells us something about a wave of investment (and disruption) in edtech in Europe. This is the third time the meeting was held and each time participation has doubled, this time to 650 people. Is this simply because it’s a well-run and well-timed initiative? Or is the series tapping into an underlying trend of growing investment into edtech? At this rate, we’ll need to hire Wembley Stadium for EdTechEurope-2022! This year we had many more visitors from outside Europe. There was a particularly interesting session from SWSWedu – great to see Zaption and Cerego there, re-connecting after our recent trip to Silicon Valley! Also, the session on “Edtech Opportunities in Asia” was very worthwhile, especially for the useful advice from Prof Ping-Cheng Yeh on China. Are these signals of a growing global market for services and technology in education? It’s thrilling to see so much innovation taking place in edtech; IBIS Capital estimates that there are more than 3000 e-learning start-ups in Europe alone. Is this typical for a wave of disruptive innovation? Or an expression of the (sometimes hyper-) local nature of education? From an investment and partnering perspective however, it’s increasingly difficult to see the wood for the trees. Is there a risk that our industry is spreading talent and resources too thinly? Looking forward >> Time for a Champions League? These questions around scale trigger my interest in the idea of a “Champions League” of edtech companies, to lead the growth and transformation opportunity for education in Europe. These companies could act as magnets for talent, ideas and capital and help to bring scale to the industry. TES Global probably has such ambitions and is backed by the deep pockets of TPG. Pearson is the World’s biggest learning company and has extensive size and international reach. Sanoma Learning has a great reputation for excellence in education and digital transformation. Who are the other players who could help bring scale to the industry? Learn Capital (London)? Google? I’m interested to hear your views on this. This entry was posted in Edtech, Education, Innovation, Learning, Sanoma, Sanoma Learning, Silicon Valley and tagged Champions League, Edtech Europe, Education, Learn Capital, London, Pearson, Sanoma, Sanoma Learning, Teacher is the killer app, TES Global on 21/06/2015 by johnrichardmartin.